Salford Analytical Services currently boast three Senior Technical Consultants with over 95 years of professional analytical science experience between them. Previous employment involved working for large manufacturing and research organisations such as ICI, Zeneca and Avecia. More recently, before joining the University of Salford, both members of the management team were part of a large commercial contract analytical organisation serving a variety of professional organisations. The Analytical service now in force at the University of Salford offers a centre of excellence for many different analytical disciplines. 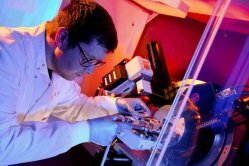 This includes an extensive suite of Microscopy techniques plus other key techniques such as Single Crystal and Powder X-Ray Diffraction, NMR, Mass Spectrometry and Inorganic analysis. The team is highly skilled in problem solving, project management and method development. We fully appreciate the urgency of sample analysis both within manufacturing and research; therefore we will always aim to deliver results within 10 working days of receiving the samples. Our customers are very important to us, and we will always advise the most effective route for solving problems. This will involve using our vast network of available instrumentation within the university campus, supplementing with the use of our network of external services if required.